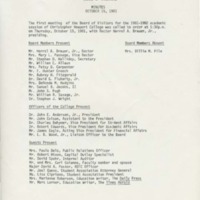 The Committee on Academic Affairs. Retreat held in Williamsburg, VA.
Review of the budget reduction plan. Discussion of part-time degree seeking and non-degree seeking students.